by Josep Lluís Mateo, Ed. Polígrafa - Birkhäuser. Barcelona, 2005. 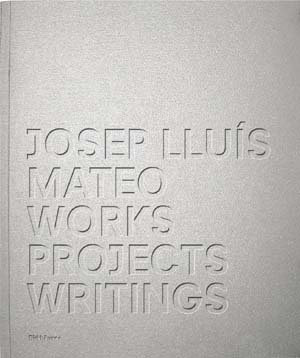 This book is a faithful reflection on the spirit and working modes infusing Josep Lluis Mateo’s lively architectural practice. Unquestionably one of Spain’s most renowned architects, Mateo’s work has had enormous influence on the international architecture scene. His projects in Paris, The Hague and Amsterdam, as well as newer designs in Haarlem, Basel and Castelo Banco, are all analyzed in depth in this volume. Josep Lluis Mateo: Works, Projects, Writings includes a photographic essay on the International Convention Centre in Barcelona–one of Mateo’s most authoritative projects of recent years. In addition there is an extensive study by Jose Luis Pardo and an interview by Philip Ursprung.